The Silencer is one of the new comic book titles from American publisher DC Comics’ recent batch of new properties spun out of the Dark Nights: Metal crossover multi-title publishing event. The story is written by Dan Abnett. It is an action series involving superpowers and murder, DC Comics’ stock-in-trade, and designed to appeal to its core demographic, readers of Batman-related titles. Interestingly, however, the lead is female. Female character-led titles traditionally have a short lifespan. DC Comics have decided to take a punt against this trend. 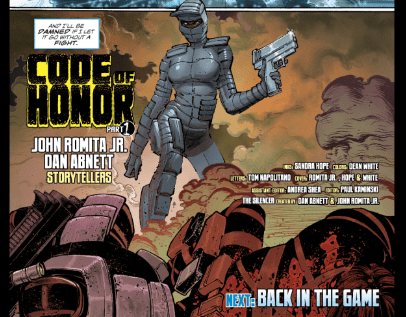 The Silencer focuses on a character named “Honor Guest,” who is pitched as one of the DC Universe’s deadliest assassins. At this point we indulge in cynicism. “One of the world’s deadliest assassins” is a title that the comic book industry likes to hand out like so much candy to just about any gun-and-sword-toting martial-arts practitioner, and as such carries very little prestige for veteran comic book readers. Such nomenclature draws a sigh. Unlike Batman & The Signal (which we have reviewed before), The Silencer is not as beholden to the story of Dark Nights: Metal. This is good. It means the comic can be enjoyed easily by new readers without requiring any backreading of the Dark Nights: Metal labyrinth of titles. The story focuses on Honor Guest as she tries to live a new life away from her past as an assassin, only to have that new life endangered when former work colleagues managed to hunt her down. The only ties to DC’s shared continuity is the appearance of Talia Al’Ghul, who is a recurring ancillary character in the Batman franchise. This appearance does not detract from the story even if a reader is not familiar with the character’s lengthy history (who, we might add, is also considered as one of DC’s deadliest assassins – it is a long queue.) Mr Abnett manages to write dialogue that efficiently conveys to readers necessary background information, without being too indulgent or out of place. The comic delivers a heavy dose of action, mandatory in a first issue involving assassins. In this case, it works because the action scenes serve as an introduction for Honor Guest, particularly her inhuman powers (she can create a localized field that negates all sound) as well as the differences between her past and present life. It is curious that DC Comics, in addition to the long shot of a female lead, have also gambled on a title revolving around a new character, rather than an existing one which has been accepted by its readership. Lady Shiva and Onyx, two very dangerous female martial artists within DC Comics’ continuity, both immediately recognisable to veteran readers, would have been obvious alternative contenders. The quality of writing does not completely negate the fact that the concept itself is not at all unique. It is all too familiar to even non-comic book readers: the story of a retired assassin compelled into the life she left behind has already been recycled countless times in various mediums. But that does not mean this comic should be avoided. Broadly reminiscent of the film John Wick, the solid execution of the plot and the stylish action scenes might be enough to keep The Silencer enjoyable, if not innovative.